Furniture Removal service that you can rely on are just one phone call away. Our experts at XS Trash will arrive to your location as scheduled, and will work as fast as possible to remove your furniture. XS Trash is fully licensed, insured, and bonded to provide you with the exceptional services that you deserve. We aim for 100% customer satisfaction, so we will work hard to exceed your expectations. XS Trash has an excellent reputation, and is well-known throughout Broward County, Palm Beach County, and Dade County. Our crew can remove your furniture anytime that it is good for you. We are available on weekdays, weekends, evenings, and also offer same-day service. Call us today to get more information. We will give you a free quote! We are a licensed and insured Furniture Junk Removal company, and all our personnel are hand-picked to assure 100% customer satisfaction. Furniture Removal service from XS Trash will really impress you! Our experts will remove your furniture without leaving traces of dirt throughout your property. The trucks that we use to remove your furniture with our among the largest in the industry, so we are able to remove many pieces at one time! Using trucks that are 21-yards in length means that we don't have to take as many trips to get the job done. This helps you save money in the long-run! For your furniture removal service we can remove anything you no longer want. 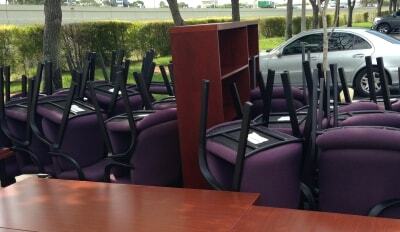 Our experts can remove beds, couches, tables, chairs, armoires, and anything else you don't want! Just let our friendly staff know exactly what you want removed and we will make certain it gets done. You will not be disappointed! Furniture Removal service is not the only service that we offer. We also offer old appliance removal, construction debris removal, remodeling cleanup, junk hauling, and so much more! To hear more about the services that we offer call us today. We will help you choose the right service for your specific needs. We look forward to hearing from you today! We Remove Junk Furniture for Residential and Commercial Properties!